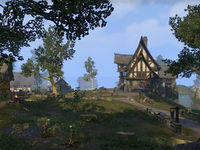 Deleyn's Mill is a farm and lumbermill in southeastern Glenumbra, east of Daggerfall. The farm has recently been ransacked by the normally peaceful spirits of the nearby forests of Daenia. Deleyn's Mill Objective: Save the village of Deleyn's Mill. Turning of the Trees: Help the Wyrd Sisters set up a ward to protect Deleyn's Mill. Ash and Reprieve: Rescue the villagers scattered around Deleyn's Mill. The Wyrd Tree's Roots: Cleanse the roots of the Wyrd Tree and evacuate Deleyn's Mill. Breaches on the Bay : Seal time breaches in the Iliac Bay region. The Wyrd Sisters: Meet with Wyress Ileana and investigate the corruption in Daenia. 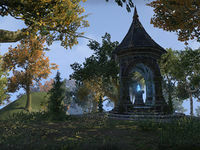 Deleyn's Mill Wayshrine is located in the woodland to the north of the mill, near Noellaume Manor. This page was last modified on 19 November 2018, at 05:25.